On November 15, players will delve further into the adventures of hero Ezio Auditore in Ubisoft's highly anticipated Xbox 360 and PlayStation 3 title, Assassin's Creed Revelations. 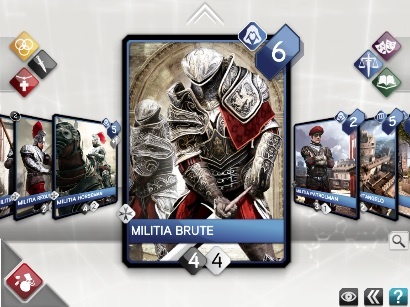 To get even more from this experience, fans can purchase Assassin's Creed Recollection, an iPad exclusive game also launching sometime in November. That said, this promising title is more than a companion piece to the critically acclaimed series. It's both an interactive encyclopedia of sorts, and full-fledged game. 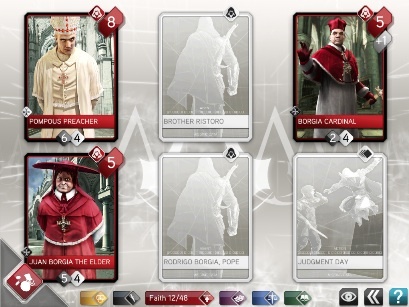 At its core, Recollection is a real-time board game that lets players engage each other and/or the computer in political battles featuring important characters and locations from the Assassin's Creed saga. From what we can tell, encounters will take place between arch enemies, the Templar and Assassins. The game ships with online multiplayer and Game Center support, as well as a ten-hour single player story mode with 20 missions to complete. At the same time, players will amass a virtual gallery of artwork pulled from different Assassin's Creed video games, offering a new sense of depth to an already rich narrative. 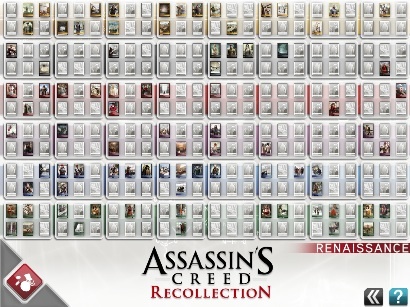 In addition, they will collect more than 280 memories that showcase characters from Assassin's Creed 2 and Assassin's Creed Brotherhood. Finally, as an added bonus, Ubisoft will top off the package with Assassin's Creed Embers, a short film that serves as the final chapter to Ezio's journey. For now, we've yet to see the game in action, but thus far, Assassin's Creed Recollection sounds compelling. Expect more details next month.